The actor Araki Yojibê I held this name from the end of the 1640s  to the 12th lunar month of 1700 . Dates of birth and death unknown. He was recorded for the first time in 1751 and his first stage name was Tsuzuki Chahei, performing in Ôsaka in kodomo shibai at the Deba no Shibai, where his father worked as a tôdori. 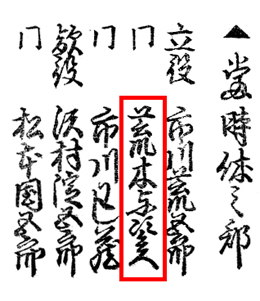 He took the names of Tsuzuki Sonezô around 1754. Then, he took the name of Tsuzuki Masuzô  in the 11th lunar month of 1756, performing in ôshibai for the first time, as a tachiyaku, at the Naka no Shibai. He finally took the name of Araki Yojibê I in the 11th lunar month of 1761 in Ôsaka at the Horie Higashigawa no Shibai. He worked in Horie as a zamoto up to the 5th year of the Bunka era (1808). No record afterwards. Dates of birth and death unknown. He was recorded for the first time as performing in Ôsaka in the 11th lunar month of 1799 in hama shibai. His first stage name was Bandô Nariemon. He went to Edo in Fall 1810 and took the name of Araki Yojibê III  in the 11th lunar month of 1810 at the Ichimuraza, where he performed as a tachiyaku. He took back the name of Bandô Nariemon at the beginning of 1814 when he went back to Kamigata, then took the name of Bandô Kinkô in the 11th lunar month of 1814 in Kyôto at the Minamigawa no Shibai, where he performed as a tachiyaku. No record afterwards. Dates of birth and death unknown. Disciple of Nakamura Utaemon III, his first stage name was Nakamura Muraemon. His name appeared in a Kabuki hyôbanki for the first time in 1816. He took the name of Araki Yojibê IV  in 1831. No record afterwards. Or the beginning of the 1650s. January 1701 in the western calendar. Tsuzuki Masuzô was the first name of Araki Yojibê I in Nojima Jusaburô's book "Kabuki Jinmei Jiten". In the latest edition (2012) of "Kabuki Haiyû Meiseki Benran", Araki Yojibê I had only one stage name. Moreover, in Nojima Jusaburô's book, Araki Yojibê II was said to be a disciple of Araki Yojibê I, who was active from 1702 to 1706. It was also reported that he gave his name to his adopted son Araki Ichinojô. For this actor, we decided to stay in sync with the latest edition (2012) of "Kabuki Haiyû Meiseki Benran". This actor was not recorded in Nojima Jusaburô's book "Kabuki Jinmei Jiten". 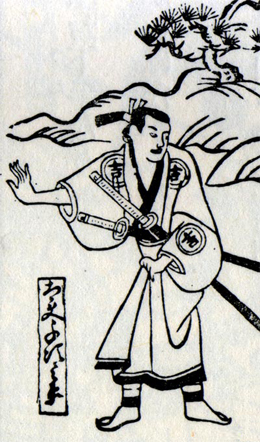 This actor was recorded as Araki Yojibê III, not Araki Yojibê IV, in Nojima Jusaburô's book "Kabuki Jinmei Jiten".